Xiaomi and OnePlus are two of the most talked about manufacturers on the Android market today. Though OnePlus has a bit of a foothold in the US already, Xiaomi hasn't established itself yet. 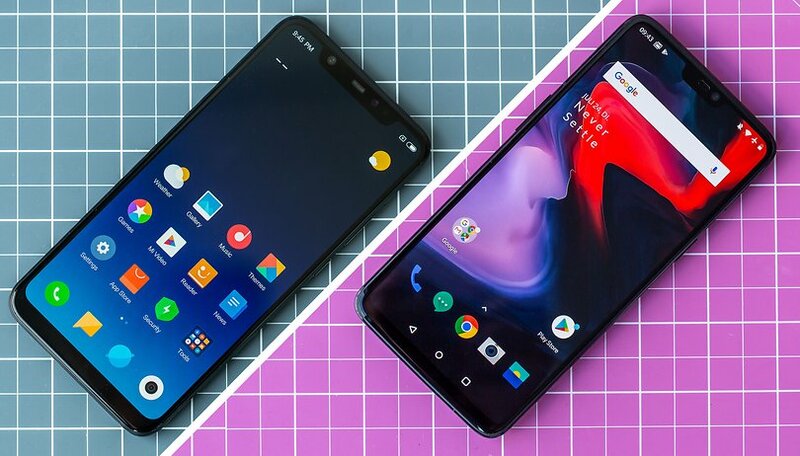 Their latest two smartphones are among the best Android flagships of the moment, and they're affordable. But which one should you buy? Here are our recommendations. Although the two smartphones are not from the same manufacturer, they have a lot in common. Both devices have a notch and a screen-to-body ratio of 83.8%, which means that devices look similar on the front. The notch of the Xiaomi Mi 8 is a little more pronounced, reminding us even more of the lines of the iPhone X. In addition to their similar size (154.9 x 74.8 x 7.6 mm for the Mi 8 versus 155.7 x 75.4 x 7.8 mm for the OnePlus 6), the smartphones also feature the same Qualcomm Snapdragon 845 and 6GB RAM processor (the OP6 also has a variant with 8GB RAM). On the memory side, Xiaomi and OnePlus decided to opt for the same strategy as Apple. So, forget any slot to expand storage. For both smartphones, you can choose between 64, 128 and 256 GB of internal memory. Obviously, from the point of view of performance but also battery life, the two are very similar. In both cases, the phones are smooth and fast. You will have no worries about gaming or multi-tasking. All in all, they are two excellent smartphones and the differences are in the details, but also in your preferences. OnePlus 6 is the only one of the two smartphones officially available in the US at the moment. For the Xiaomi Mi 8, you have to go through the troubles of importing (no warranty, no customer service, expensive and slow transport, customs fees, etc...). On the contrary, OnePlus 6 can be easily purchased from its website or from e-commerce giant Amazon. Two schools clash in our duel. On the one hand, OxygenOS 5.1.9 is based on Android 8.1 Oreo and is relatively "pure", in Google's sense. On the other hand, Xiaomi's MIUI overlay which is also based on Android Oreo, but closer to iOS aesthetically. OxygenOS will please Android fans. The menus are relatively similar (despite some slight differences), we can already find the influence of Android P. Navigation by gestures is also possible (Xiaomi also offers it). A swipe up will take you to the home screen. A swipe up from the left or right side of the bottom border acts as a return key. To access multitasking mode, simply swipe from bottom to top and hold. On another note, there is no bloatware. If you like originality (and the color red), the latest version of OnePlus 6 will delight you. Available at launch only in Midnight Black, Mirror Black and Silk White, the OnePlus 6 is now available in red. According to Pete Lau, one of the brand's founders, the red color was obtained using an original lamination technique for "a more elegant red, which leaves a strong impression of quality and value". The OnePlus 6 may be a flagship, but it is one of the few to still offer a headphone jack. The OnePlus smartphone has not given in to the temptation to go totally wirelessly, even despite the launch of the Bullets Wireless headphones. Always a convenient option to own. The budget question is always paramount when you decide between two models. In the absence of an official price list, the Xiaomi Mi 8 is generally cheaper to buy than the OnePlus 6, and despite the fact that it must be imported. Sites like Gearbest regularly offer good prices. Compared to the OnePlus 6, you can sometimes save over a hundred dollars. Though both smartphones are relatively good at photography, my preference still turns to Xiaomi's smartphone. Of course, the differences are not obvious but the Mi 8's dual camera (12 MP (f/1.8) + 12 MP (f/2.4)) does better. The exposure is precise, the colors are rich and vivid, the white balance excellent and the noise on the pictures taken in low light is rather limited. Special mention: the bokeh effect is very successful. The Mi 8 not being officially available, the smartphone becomes rarer and it is thus a bonus with the originality and the audacity for the owners of the apparatus. The Mi 8 is a fairly successful attempt by the Chinese manufacturer, able to compete with all high-end smartphones. The smartphone is full of qualities: an attractive design, an AMOLED display and a compact form-factor. Finally, its biggest flaw is that it is not marketed in the rest of the world. Clearly, we're dealing with two very premium Chinese flagship smartphones. Both units are well designed and have great build quality, and offer excellent specs. Personally, I would advise you to opt for the OnePlus 6 since the Xiaomi Mi 8 isn't officially available and you can't get customer service or a warranty on it. With the OnePlus flagship, I don't feel like I have to sacrifice anything, and that's an important feeling when you spend several hundred bucks on a smartphone. Its ultra-fast Dash charge is an important argument in its favor, as well. Which phone are you leaning towards? Choose “Xiaomi Mi 8” or “OnePlus 6”. To this date Oneplus smartphones are manufactured by OPPO. Yeah, you can get one with a "U.S. warranty" but that doesn't really mean a lot. You still have to ship it back to the manufacturer (unless you pay extra for Amazon etc). It's still a big headache to get support for Oppo's OnePlus phones.